She sat on the crinkly exam room paper, her eight-year-old body tiny on the table meant for adults more than twice her size. Her paper gown the nurse had given her was bunched around her neck, her shoulders were hunched, and her big, brown eyes were round with anxiety. “Here we go,” the nurse said, and my little girl grabbed my hand. What followed was what seemed like a forever-long series of scratches and pricks on my daughter’s smooth back. Each little mark had been numbered with a green Crayola marker, and by the time the nurse set the timer for 15 minutes, the uncomfortable itching had already started. I stepped behind her to look, and the swelling was already showing what we feared. It was her second allergy test – one of those miserable requirements for those whose bodies refuse or are unable to handle certain things the world throws at them. She’d recently had reactions with “no known source,” so as a precaution we knew the test would be a good idea. “It’s just part of my life,” she said, with wisdom beyond her eight years. I had to explain it in greater detail that night to a younger girl at vacation Bible school. She asked what an allergy test is, and why my daughter had to have one. And as the kids started doing a project relating to that night’s Bible story, my own words stuck in my head. While cutting pipe cleaners and rounding up glue sticks and fetching paper towels for the craft, I thought about her little body and its hypersensitivity to things that don’t affect most people. I thought about the first time she complained of an itchy mouth after eating some trail mix, and I thought about the first time we used the epinephrine trainer to show her what she’d have to do in an emergency. I thought about how we had emphasized the importance of communicating her symptoms to us and whoever is in charge, and how we drilled into her how critical it is that she not wait until she’s sure it’s a reaction to tell someone. “Once you’re sure it’s a problem, it could be a really big problem,” we’d told her, not to scare her but to make sure she knew we meant business. In the weeks since her allergy test, I’ve done a lot of thinking about allergies and how different people are unable to tolerate different things. Then I remembered something from a few years ago. When my daughter was a toddler, I got in the habit of watching a regular lineup of sitcoms in the afternoons as she napped. It was good for me to at least see adults during the day, and to hear adult conversations before my poor, unsuspecting husband came in the door to a people-starved wife. It was a good thing, I reasoned, and I didn’t feel bad about taking that time for myself. Before long, as networks do with daytime TV, the lineup changed and a new show was added. It was funny – one I hadn’t seen before, with a young childless couple navigating the early years of marriage and careers. I thought it was a good show. Within a couple of weeks, though, I began to notice something. I began to feel uncomfortable with some of the dialog in the show’s script. The language wasn’t bad, but the message was. It made me uncomfortable to hear the way the wife spoke to her husband, and it upset me to watch as she disrespected him in front of their friends. Something in me bristled at the names she called him, and I began to dislike her character for how mean she was to him. I kept watching, though, because….routine. But then I noticed something more troubling: I began to think of my own husband in just the same way the unlikeable character on TV spoke to hers. He hadn’t done anything to me – certainly nothing deserving of the disrespect I was giving him (because disrespect in thought is just as bad as disrespect in words). I was deeply upset when I realized my thoughts were nothing like the thoughts of a loving, respectful wife. The show itself had upset me, but the realization that I had internalized the very thing I disliked about it? That wrecked me. So I confessed to my husband what had been happening in my mind and, obviously, in my heart…and refused to watch the show anymore. It was simply not good for me. 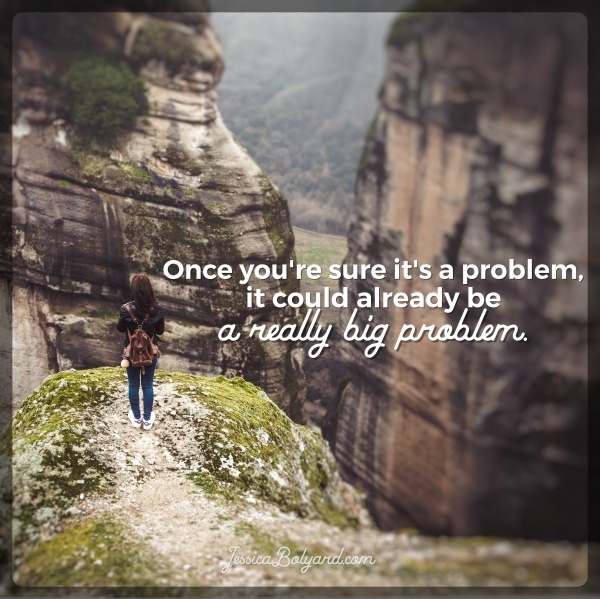 At first, there had been no problem…but by the time I became aware of it, it was already a big problem. 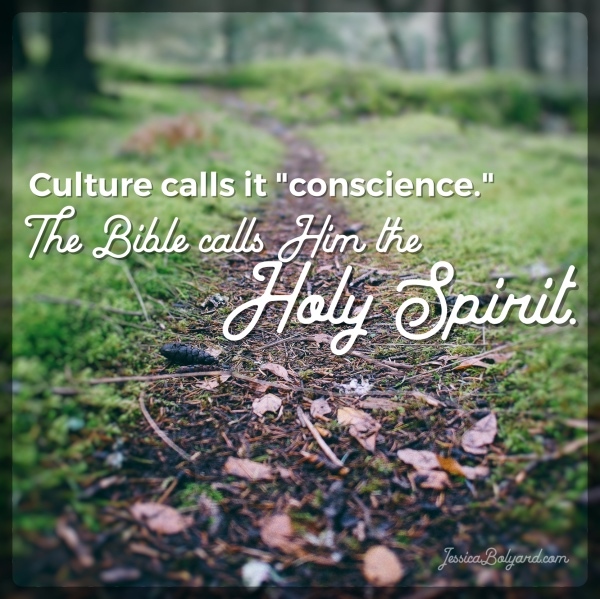 Culture calls it “conscience.” The Bible calls Him the Holy Spirit. The Holy Spirit of God lives inside me – inside you – and actively works to lead us away from the death that comes from the natural inclinations of our flesh. The path that’s most natural to us leads nowhere good. The path of the Spirit, though, leads us to life and peace. His is the path of greatest resistance, but when followed, leads to Jesus. The further down the path we go, the more our character begins to look like the character of Christ Himself. The character of Christ…not the character of Jessica. And the Spirit – because He is gracious and desires nothing but God’s best for us – helps us to stay on the path. Like the caring Shepherd that He is, He takes His staff and leads His wayward sheep back where we belong. It’s not to scare us, but to make it clear that He means business. 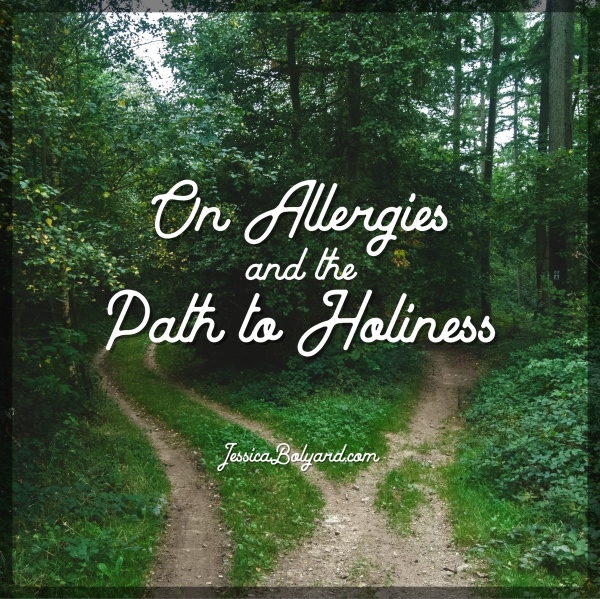 He nudges us…pokes us…gives us all kinds of signals to keep us from the harm of wandering from the path. He shows us what we need to stay away from…and points out the problem when we stubbornly refuse His advice. The show we’re watching…the people we’re spending time with…the websites we’re visiting…the habits we’re encouraging. If it’s not good for us, He’ll let us know. That weird, unsatisfied, uncomfortable feeling? It’s our own spirit having a reaction to something we can’t tolerate. It’s the Spirit inside us flashing every warning sign He can. It’s Him telling us to get the heck out of there. The show I was watching? I have Christ-following friends who watch and enjoy that show and others like it. They have no great sensitivity or intolerance for its contents. It’s not a dangerous problem for them. For me, though, it’s very dangerous. Like my daughter can’t eat a peanut butter sandwich while most of her friends can, I cannot expose myself to certain attitudes while maybe my friends can. Not a problem for them. Big problem for me. My spirit reacts in a bad way. This may not make any sense. My point is just this: pay attention to those nudges. They’re important. 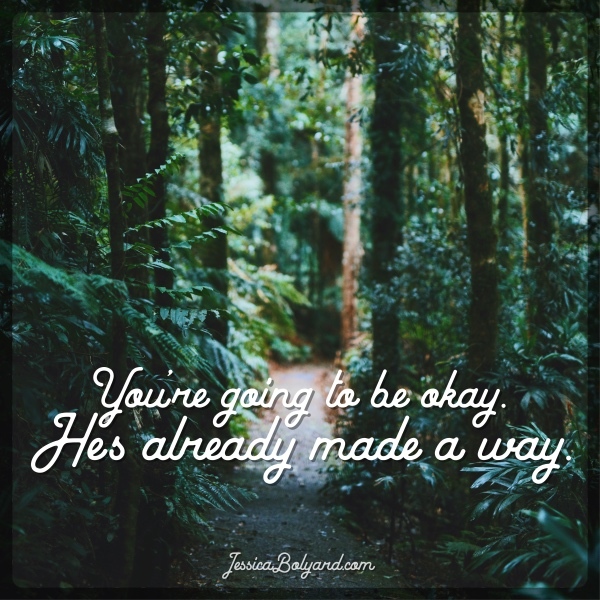 When something in you feels icky or uncomfortable, listen. The Spirit will not sit idly by as you wander a path that is dangerous to your heart. He won’t tolerate threats to your holiness, and won’t permit threats to His character growing inside you. He’ll let you know. He’ll alert you to a reaction, and then it’s up to you. Just remember that by the time you realize it’s a problem, it may have already become a big problem you can’t ignore.